Solanyl® BPs are bio-based and biodegradable plastic resins used as a replacement for petroleum-based plastic resins, for the purpose of injection molding rigid objects. Solanyl® BP is made from potato starch reclaimed from the food processing industry. Potato starch leaches out into the processing water and is usually lost to further processing. By reclaiming this starch, Solanyl Biopolymers not only solves a waste water issue, but also gains a renewable resource to be further processed into a bio-based plastic. 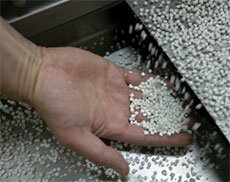 Using a patented process, potato starch is converted to a plastic-like resin that can be heated and shaped into a multitude of products through the injection molding process. Lower energy inputs to produce the biopolymers - 65% less energy compared to polyethylene production. Lower energy inputs to manufacture bioplastic products made from Solanyl BP when compared to petroleum based plastics. Biodegradable and compostable according to EN 13432 standards. The word Solanyl is from the name Solanum tuberosum, which is the scientific name for the common potato. Please feel free to watch a video about our company here.